Many a times i have seen people giving different analysis lines in chess websites and forums which people do mainly using Rybka. Although, i don't have Rybka, but i have 'Chessmaster - GM edition' installed. Today i saw a tab called "mentor lines" while playing a game with Chessmaster. I had put the option of "5 best moves", and i got a list which i am have put as an image attachment. I am not able to understand this. Which best move to select? Referring the picture: The search depth for all are same that is, 1/9.what is different is score, time and corresponding moves for that score. So, is it that the move with highest score is the best amongst all? In the case of picture, the last one? Score 0.67 is the best amongst all? But then why does the chessmaster (if i am not mistaken) selects the lowest move score? Finally, last question: What is this big number in positions column? I am puzzled with this list? Can any one please help me in understanding this? P.S: Folks as many of you can answer it will be better for me as will help to clarify concepts further. I speak generally for chess engines, not particularly chessmaster. Generally the more time you will let to your engine, the more accurate play it will find. So to a move evaluated after 10s thought, give it less confidence, than a move found after 1 min thinking, even if the first one was higher rated. Generally if you give more time to your engine, he will find moves with better and better evaluation, but this is not sytematic, for example while examining all possibilities he can discover a hidden attack and consequently its evaluation will fall down. Anyway the move found at least will be the best defense. Depth column means it searches 9 moves ahead, but considering all engines this is not an absolute depth, because already at depth 9, the combinatorial is heavy. Engines do tree pruning, and do not strictly evaluates branches that are considered "weak", it prefers to search deeper in promising lines. So the depth displayed should be understood as some kind of average depth. Anyway given a certain depth, we can consider that the 5 bests moves can be trusted with the same confidence regarding evaluation. So "a6" is the best move for the chess engine point of view. BUT, best moves for chess engines are not necessarily best moves for a human, generally they are, but sometimes the tactics underneath are too complex for a human to calculate accurately, and you would maybe prefer a lower evaluated move but easy to carry on (to developp the line without worrying too much of possible blunders). For example in endgame, human will prefer to "simplify" the position via material exchange, while a computer will always search for a crashing continuation at a price of complications, sometimes the no-brainer move is just good enough. So among the 5 moves proposed, that seems almost equally good, you may want to pick the one that suits your playing style the most! And to answer your question, position column i think it is the number of positions evaluated internally by the engine. To my opinion it is meaningless, as i said before, tree prunning is selective, so a move with 3 millions positions evaluated is not worst or better than a one with only half a million. Although, modern chess engines like Rybka since you told about it, is evaluating only 10.000 or 20.000 positions compared to millions by old style engines, because the evaluation function is slower but more precise, same for human, they calculate very slowly, evaluate only a few (20 to 100 maybe) positions, but they do it very accurately and its enough to compensate the lack of covering of all possibilities. Finally when you play against your chess engine, the move selected depends i guess from the settings you entered. If you configured the engine to be a total patzer, it will not play the same moves than if you selected godzilla warrior level. But internally the engine knows only to evaluate good moves, and the level setting will just tell the interface to select the best or one of the inferior moves. It is not able to calculate badly (unless you let it nearly no time to think) just because you selected the dummy level. You are black so the best line is the one with the lowest score. When you are white, the best move is the one with the highest score. BorgQueen wrote: You are black so the best line is the one with the lowest score. BorgQueen, so do you mean that the scores are with respect to white always? I did not understand your logic behind this theory. HangingKing wrote: I speak generally for chess engines, not particularly chessmaster. HangingKing, can you help me with the scores part? Why mostly the chessmaster chooses the lowest score as the best move? Also, i chose the strongest opponent, the chessmaster itself, then why everytime it choose the least score as the best move? Hey, try to just answer messages, avoid quoting these big texts ! 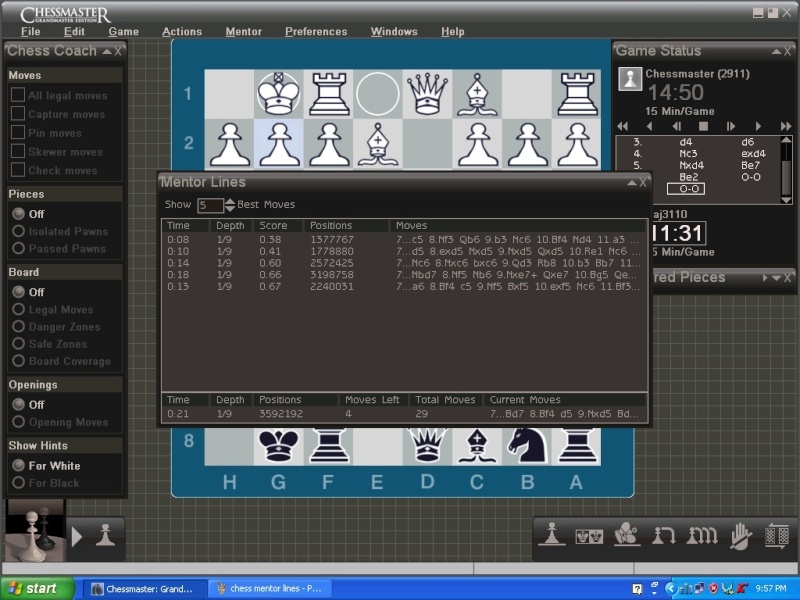 For the score part, i don't know, i do not have chessmaster, and i cannot guess what it does. I play with Arena GUI and various chess engines that can be plugged into it and have not noticed strange move selection, always the best move is selected. Regarding evaluation, some chess engines display absolute rates, some other subjective rates. Absolute rate is rating according to white's point of view, so positive score is in favor of white, while negative is in favor of black. Subjective rate is positive when in favor of the player who is about to move, and negative otherwise. Generally, the GUI has a setting to automatically convert ratings to absolute or subjective, it all depends of what you like most, personnaly i prefer subjective rating. Correct. 0.00 is equal, 1.50 is white ahead by 1 and a half pawns, -1.50 is black ahead by one and a half pawns. This is how ALL chess engines assess a position. I can't imagine chessbase being any different. You have received some good answers already, but let me clarify a couple of things. You have the software set up to present the five top moves, all five have been evalulated to a depth of 9 moves, so the order presented is best (at the top of the list) to the worst (at the bottom of the list). Looking at the numbers, there in little difference between the top two moves, or the bottom three, so I wouldn't put too much stock in the numerical values. Also, evaluations will deviate sometime widely as you make moves down any of the variations, so don't put too much stock into what a numeric values is. Another program, Aquarium, strength is that it allows you to go down a particular variation to address this very issue and is the software I use for this type of analysis.